I recently took delivery of one of the most significant purchases I’ll ever make in my life. It’s up there with the house, the visa to come and be with Cowboy, and Sunshine in terms of important purchases. It was my saddle. 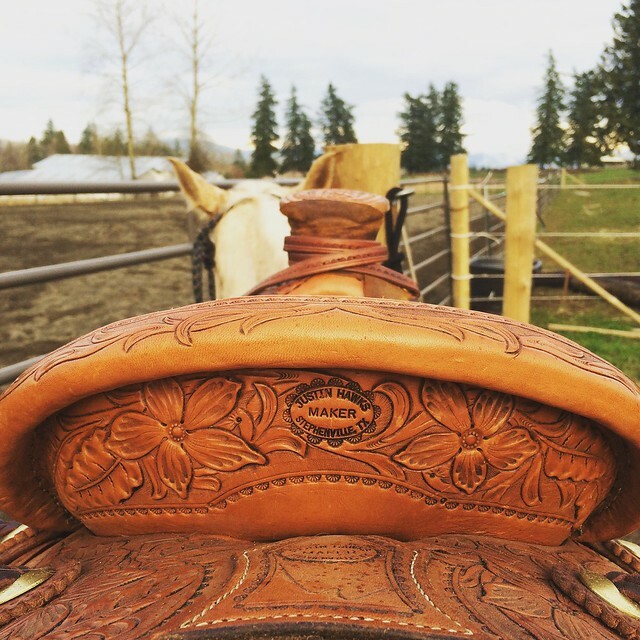 I asked Justin Hawks of Hawks Custom Saddlery to build me a saddle. I had discovered him through Instagram, where follows lead to follows, and after looking at a few of his pictures of his work, I summoned the courage to message him and ask if he would build a saddle for me. He was kind enough to oblige, and spent his winter tooling, stitching and generally working some kind of magic. The saddle is a work of art, and should be the subject of another post where I just gush over how perfect every tiny inch of it is, but what I want to talk about today is more exciting. It’s about what happens when I put this glorious artifact on my horse’s back and climb up into it. For starters, it puts me closer to the horse. I feel her, I am sensitive to her whole back, and this means she can be sensitive to me. The fenders and stirrups hold my leg correctly, under me, where my leg can be effective and precise, where my old seat would have my lower legs flapping about. The seat hugs me down and around her ribs. Yesterday, I finally found my spot in this saddle. I had to be less eager to sit, and just let the rig do the work. One of my favourite groups on Facebook discusses traditional horsemanship, and a pithy phrase is often brought up: “Let the gear do the work.” I tried to relax and think about something else, and suddenly I stopped bouncing around. I melted into the leather, melted into Sunshine’s back. I tried not to work hard at keeping my heels down, and trust the fenders to look after me. My lower leg stopped flapping and my spurs stopped banging. From here, I noticed my hands were flailing about all over the shop, and I made a conscious effort to keep them quiet and still. I gave Sunshine as much rein as I could, so the hackamore would be uninterrupted by me. For two magical steps, I felt like we had it together. Maybe we could make a go of this vaquero thing after all. Then she dropped her shoulder, motorbiked herself over to the fence and proceeded to barge along with her nose out and her back hollow until she could see her friends, and our ride went downhill from there. Something to work on, I suppose.